The Basílica i Temple Expiatori de la Sagrada Família (Sagrada Família for short) is a Catholic Church located in Barcelona, Spain. Translated it means Basilica and Expiatory Church of the Holy Family. Construction of it commenced in 1882, and it reached its midway building point in 2010. Yes, you read that right. It's taken 128 years to only get halfway done, but some of that can be attributed to the Spanish Civil War and relying solely on private donations for construction. It's completion date is scheduled for 2026. If/when it does finish, artistically, it will be unlike any other church building and will be an impressive feat of Gothic architecture. 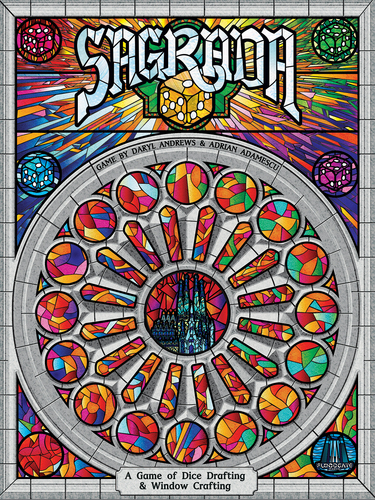 Inspired by this artistic achievement, Floodgate Games has created a game called Sagrada. It is being dubbed as "A game of Dice Drafting and Window Crafting." It will seek funding on Kickstarter on September 12th. Let me tell you a little bit about the game. In Sagrada, you are an glass artisan competing with up to three other artisans to create the most beautiful stained glass windows for the Sagrada Família. You will do this by rolling dice and placing them on your Glass Window Card. The game is designed for 2-4 players, ages 13+ and takes approximately 30 minutes to play. 1. Give each player a random Glass Window Card and a Window Frame Player Board. 2. Slide the Glass Window Card into the Window Frame Player Board, and give each player the number of Favor Tokens indicated on the bottom of their Glass Window Card. 3. Put all 90 dice into the dice bag. 4. Shuffle the Tool Cards and place three of them in the center of the table. 5. Shuffle the Public Objective Cards and place two in the center of the table. 6. Shuffle the Private Objective Cards and give one to each player to keep hidden. 7. Randomly pick a start player and give them the dice bag. Game Play - Sagrada takes place over ten rounds. 1. The starting player randomly pulls 2 dice per player plus 1 extra die out of the bag and rolls them. (2 players = 5 dice. 3 players = 7 dice. 4 players = 9 dice) This form the Draft Pool. 3. On your turn, you may perform the following two actions (both optional) or pass. 4. Pick one die from the Draft Pool and place it in an open space on your Glass Window Card. a. The first die you place must be placed on an edge or corner space. b. All subsequent dice placed must touch (orthogonally or diagonally) a previous die placed. d. You can never place a dice orthogonally next to a die of the same color or shade (number). 6. Starting player is passed clockwise. 1. Public Objective Cards can be scored multiple times. 2. Private Objective Cards are always a specific color. You receive one point for each pip on the dice of your color. 3. Leftover Favor Tokens score one point each. 4. You lose one point for each open space on your Glass Window Card. As a Catholic who enjoys board games, it's both surprising and refreshing to see a game that has a religious theme without proselytizing its audience. It has a simple theme of rolling colored dice and placing them strategically so that they don't violate certain placement rules. However, Sagrada is so much more than that. It's not only a game but a work of art. I only received a prototype of the game, but the dice (both amount and colors) have left everyone in awe. Blue does seem to be the favorite, but they all are beautiful to behold and play off the light, just like a stained glass window. As you are filling in your card, the colors come to life more and more. You forget you are playing a game and really feel like you are working on your own little masterpiece. Don't let the dice distract you or cause you to dismiss the game as too random. For such simple mechanics, each decision becomes more and more of a brain burner of which die to take and where to place it. Thankfully, the plethora of Tool Cards not only provide you with a lot of replay value, but they also serve to help mitigate some poor rolls or lack of good choices. With all the people, I have been demoing and playing the game with, I have only found one complaint so far, and that is the disappointment in it only playing four players. There are no plans for expanding the player count, but if you have a larger game group, you could always back for two copies and combine them. Bear in mind though, if you are the first player, it would take a looooong time to snake back to you for your second turn (A-B-C-D-E-F-G-H-H-G-F-E-D-C-B-A). 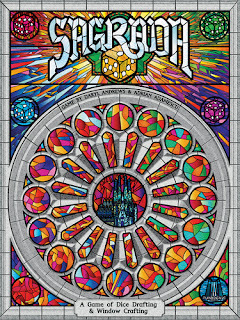 Be sure to look for Sagrada on Kickstarter September 12th and back this project if you want a thinky and beautiful game. This prototype was provided to me for free by Floodgate Games in exchange for an honest review.